AA – Alcoa, Inc. – Bearish options traders decided to pay Alcoa a visit this morning in order to pick up large numbers of put options in the November contract. Shares of the aluminum giant fell as much as 2.7% in the first half of the session to touch an intraday low of $12.77, but have recovered somewhat as of 11:50 a.m. to stand 0.60% lower on the day at $13.05. Pessimistic players piled into put options at the November $13 strike where more than 32,600 contracts changed hands by midday. It looks like the majority of the activity was initiated by one bearish individual who purchased approximately 23,000 puts at that strike at a premium of $0.55 per contract. The investor may be utilizing the puts to protect an existing position in the underlying shares. Alternatively, this transaction may represent an outright bearish bet on the aluminum maker. 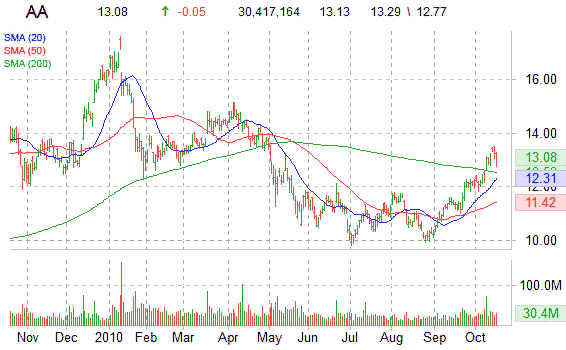 The put buyer starts to make money if Alcoa’s shares fall 4.6% from the current price of $13.05 to breach the effective breakeven point to the downside at $12.45 by expiration day next month. Alcoa’s overall reading of options implied volatility is up 6.6% at 36.02% as of 11:55 a.m. in New York trading.